after teaching from 10-6 (with a break for some yummy yoga 2), i'm cuddled up at home with a snoring pug on my lap, tazo rest tea in hand, and takeout chinese in belly. before i start on my BIG paper due tuesday (boo! ), i wanted to share a quick pic of inspiration. ever since le beau bought me a vintage silk dress for our 7-year anniversary, i've been hanging clothes around chez moi (and, yes, that dress is still hanging in the same spot as the january blog post!). these two dresses are deux new adds: a strapless lace dress with tulle flared skirt ($35 secondhand) and a vintage replica silk dress with pleats ($48 secondhand). they are just too pretty to hang in a dark, lonely closet! 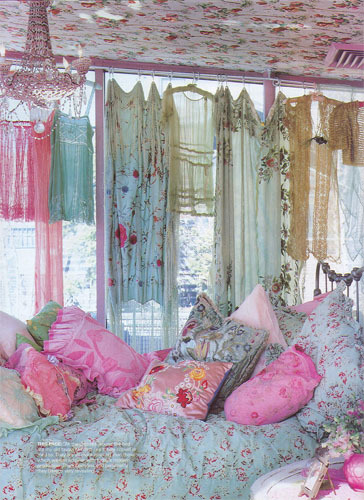 watch out, chez moi may begin to look more and more like this inspiring photo from betsey johnson's apartment. vintage, frilly, feminine pieces deserve daily sunshine. happiest of sundays to you!